1 1/2 quarts water or fish stock - approx. Drain the clams, reserving both the clams and their liquid. Add enough water or stock so that the total liquid equals 2 quarts (2 liters). Simmer the potatoes in the clam liquid until nearly cooked through. Strain and reserve the potatoes and the liquid. Render the salt pork without browning it. Add the onions and celery and sweat until tender. add the flour and cook to make a blond roux. Add the clam liquid to the roux, whisking away any lumps. Simmer for 30 minutes, skimming as necessary. Bring the milk and cream to a boil and add to the soup. Add the clams and potatoes, and season to taste with salt, pepper, Tabasco, Worcestershire and thyme. Garnish each serving with fresh herbs. 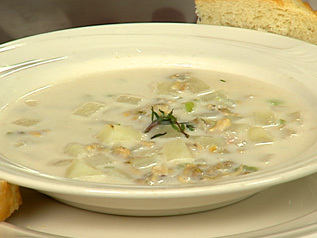 NOTES: * If using fresh clams for the chowder, wash and steam approximately 1/2 bushel of chowder clams in a small amount of water to yield 1 1/4 quarts (1.25 liters) of clam meat. Chop the clams. Strain the liquid through several layers of cheesecloth to remove any sand that may be present. Add enough water or stock so that the total liquid is 2 quarts (2 liters). Continue with the recipe, starting at step 2.